Next month will see the introduction of new SATs tests, which the government is introducing as part of reforms designed to ensure that every child gets a “solid grounding” in the basics before the start of secondary education. The reforms will cover tests in maths, reading and spelling, punctuation and grammar sat by 600,000 pupils a year at the age of 11. Corresponding exams for seven-year-olds are also being toughened up. For the first time, pupils will be tested in all topics in the curriculum – including the most complex issues – reversing a previous decision that saw stretching material limited to those taking special “super SATs” exams. Some of the biggest changes will be seen in maths following concerns from ministers that English schoolchildren are lagging dramatically behind their peers in the Far East. At the end of primary school, pupils will answer questions based on their 11 and 12 times tables – as opposed to 10×10 at the moment – and add and subtract fractions with different denominations and mixed numbers. They will also be expected to calculate the area of a parallelogram and a triangle and the volume of a cuboid. Children will be banned from taking calculators into the test hall to improve standards of mental arithmetic and they will only be given extra marks for employing traditional methods of calculation – long and short multiplication or adding and subtracting in columns. Examples for 11-year-olds in maths include finding the answer to 555 + 656, 120 – 15 x 5, 2376 x 15 and asking them to identify the missing fraction in ⅓+ ¼ + ? = 1. Meanwhile, new reading tests will ask pupils to identify and comment on writers’ use of words, phrases and language, distinguish between a fact and opinion, give the meaning of words in context and provide their own synonyms for specific words within written texts. A grammar and punctuation test will require pupils to identify a subordinate clause, recognise adverbials and assess the use of verbs in the perfect form to mark relationships of time – for example “have” versus “had”. A science test will also be introduced for 11-year-olds, but it will only be taken by a small group of pupils in any one year to track national standards in the subject. Can you pass the KS2 SATs mathematical reasoning test designed for pupils in their final year of primary school? All the questions below have been adapted from sample mathematical reasoning question papers for 2016 published by the DfE Standards & Testing Agency, so you can be sure they’re a true reflection of the tests. See how many you get right. You have 20 minutes to complete the quiz. Good luck! Congratulations! You have completed your KS2 SATs Mathematical Reasoning test. Now try our SATs English test. Which of the following digits is in the hundredths place? The mass of a 10p coin is 6.5g. The mass of a 5p coin is half the mass of a 10p coin. 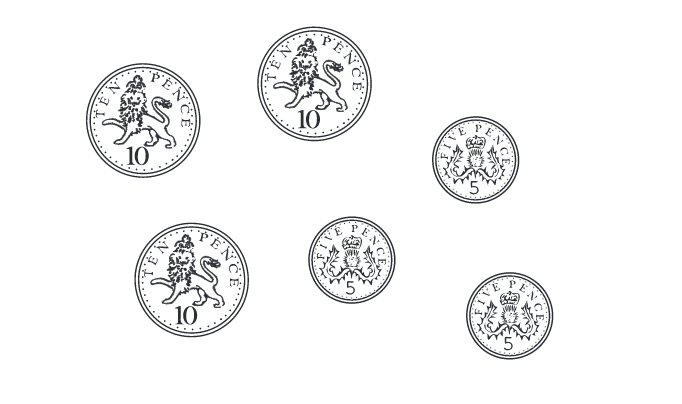 What is the mass of these six coins altogether? 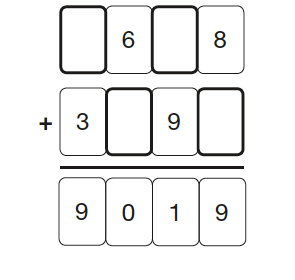 Write the four missing digits to make this addition correct. 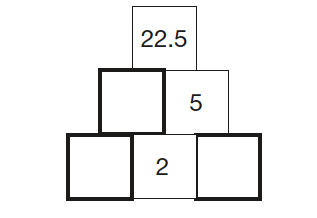 Here is a number pyramid. The number in a box is the product of the two numbers below it. Here are the ingredients for chocolate ice cream. Stefan only has 300ml of cream. How much chocolate should he use? 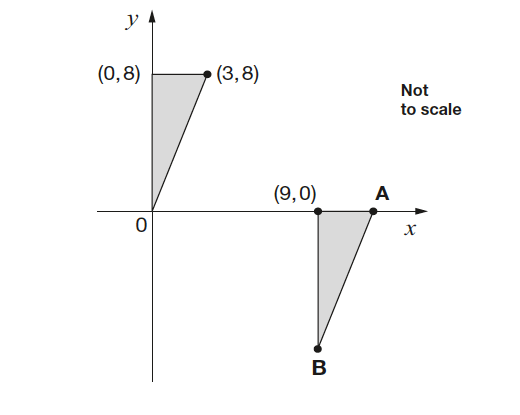 Here are two identical triangles on coordinate axes. Write the coordinates of points A and B. Large pizzas cost £8.50 each. Small pizzas cost £6.75 each. Five children together buy one large pizza and three small pizzas. They share the cost equally. How much does each child pay? Here is a number written in Roman numerals. Write the number in figures. The graph shows the temperature in six cities on one day in January. 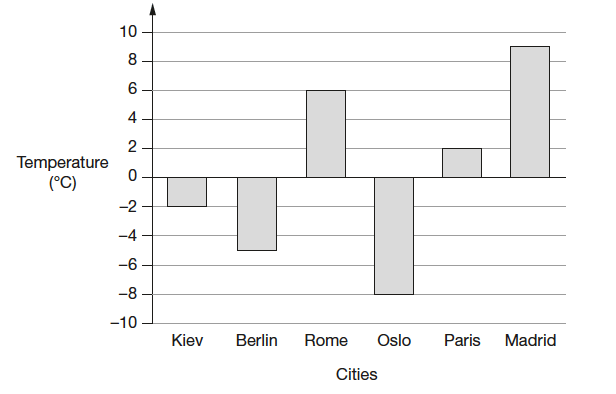 Which city was 4 degrees warmer than Kiev? This model is made with 20 cubes. 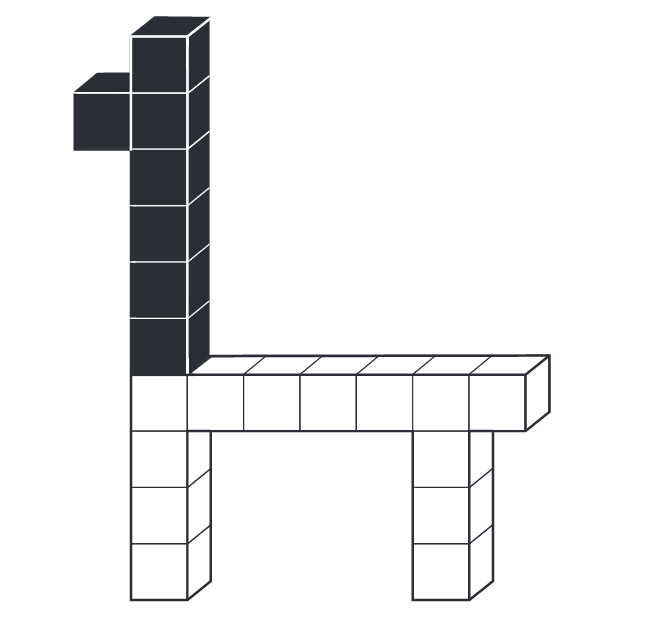 What percentage of the cubes in the model is black?